I mostly concur with this review. If, as one of the reviewers below notes, Specters of Marx concerns methodology (or deconstruction as a whole) rather than Marx per se (or, less importantly, Fukuyama [as easy a target here as he was for Zizek:]), then we have to wonder what it does at all? While Derrida explains, several times, that he wants to hold out the Messianic hope of what he might have called a ‘Marxism worthy of the name’ (or indeed a Marxism beyond the name of Marx], and that he does not mean to dismiss the importance of political action, I can’t help but feel that he’s talking about Marx not because of his political content but simply because Marx is there for the taking, like anyone else. Why even talk about Marx (etc) if Derrida speaks repeatedly of “a certain Marx”? 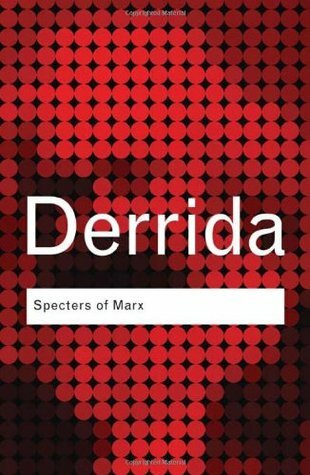 Derrida takes Marx to task for wanting to get at the ghostless real, but Marx’s hope for a pure presence is the hope of just about any thinker. If Marx falls down, then so does [name your thinker:]: one text is as good another, because all of them speak the same truth of deconstruction. We get, via Marx, via Hamlet, via Blanchot, via Stirner, via, at times, the gormless Fukuyama, much of the same, if we’ve been reading much Derrida: he explains, again and again, the gift and the host and responsible decision and justice and the to-come and a nonteleological eschatology (what I’ve elsewhere called “an Apocalypse without an Eschaton”), all of which allow something new to perhaps enter the world. It’s not useless of course. The line bewteen disembodied spirit (think “spirit of the age”) and specter (which has a spectral body, a bodiless body) should be remembered and worked over, not least of all because it conjures the best bit, “hauntology” (pronounced in French like “ontologie”). The review above rightly notes the superiority of this concept to “trace” or “difference” because it gives a clear (kind of) presence to what is (only purportedly) absent from the (supposedly) present-at-hand signifier. The trace also has a (spectral) body.